The Laugh Man on Earth! 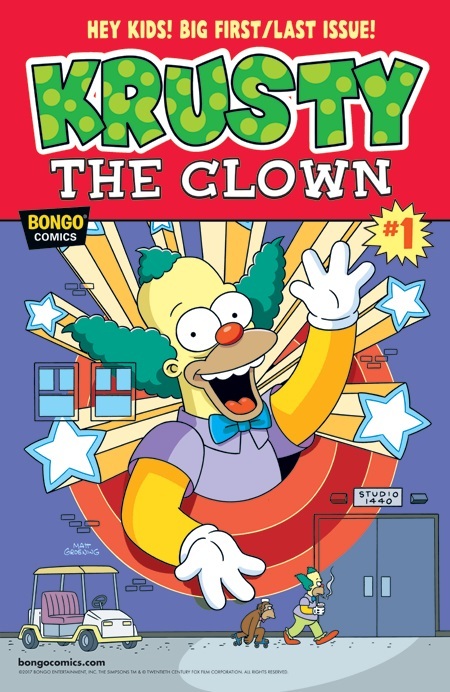 Krusty the Clown #1 is an issue in the Simpson Comics One-Shot Wonders series. It was released at Simpsons Store released on April 19, 2017. 2.1 The Laugh Man on Earth! "In the first story, Krusty finds himself alone and wandering the empty streets of Springfield. All that he is left with are his memories of a life in showbiz lived to the fullest–a little song, a little dance, and a little seltzer down his pants. But where did all the people go? Next, see Krusty introduce Krustyburger’s new Megameal Deal with less than ideal results. All this, plus a bonus pinup! " Main article: The Laugh Man on Earth! Modified on July 25, 2017, at 09:14.